Here you will find information for Alegre Retreat as well as fiber art. Alegre Retreat is the premier conference for devotees of the fabric arts, providing an escape from everyday life for art quilters to come together to learn and share their expertise. Each year, dozens of quilting enthusiasts migrate an hour south of Grand Junction Colorado to Gateway Canyons. They gather together for the Alegre Retreat, the premier conference for devotees the fabric arts. 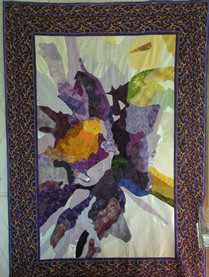 Beginning in Santa Fe, New Mexico in 1994, Katie Pasquini Masopust has successfully organized the retreat with the goal of highlighting the variety of quilting methods and specialties in this rich branch of the fabric arts. Alegre Retreat will return to Gateway Canyons Resort in April 2020. The conference will feature Jacquie Gering’s class, “Composing with Line”; Jean Wells Keenan’s class, “A Sense of Place”; Laura Wasilowski’s class, “Fuse-Design-Stitch”; Katie Pasquini Masopust’s class, “Jumpstarting Your Creativity”. The retreat will span April 12th to April 17th and will include five days of instruction. Students can choose to study with one of our instructors, Jacquie Gering, Jean Wells Keenan, Laura Wasilowski, or Katie Pasquini Masopust and hear lectures from all four.